Jeffrey Sosman, MD, professor of Medicine in the Division of Hematology and Oncology, was a co-author on a new study published in the journal Nature. Specialized antibodies appear to be highly effective in treating desmoplastic melanoma, a rare type of melanoma, according to a study published in the journal Nature. The antibodies, called anti-programmed destruction 1 (anti-PD1) and anti-programmed destruction ligand 1 (anti-PD-L1), release the immune system to attack cancer cells by blocking immune checkpoints on immune cells. Patients with desmoplastic melanoma (DM) who were treated with this immune checkpoint blockade (ICB) therapy had a better-than-expected benefit in response to the treatment. The study was co-authored by Jeffrey Sosman, MD, professor of Medicine in the Division of Hematology and Oncology. 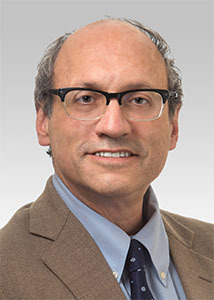 Sosman is also head of the Melanoma Program and co-leader of the Transitional Research in Solid Tumors Program at the Robert H. Lurie Comprehensive Cancer Center of Northwestern University. DMs account for fewer than four percent of all melanomas and are characterized by resistance to chemotherapy and a high number of mutations in their genes, the mutations being a product of long-term sun exposure. In addition, DM’s dense and scarred tissue has been thought to limit the usefulness of immune therapies, making it a difficult cancer to effectively treat. Previous studies have found that ICB therapy produces better results in a number of cancers with a high burden of mutations — including melanoma, lung cancer and bladder cancer — making it a prime candidate for treating DM. The investigators examined pathology reports from over 1,000 melanoma patients, finding 60 who had advanced DM and were treated with ICB therapy. While only 35 to 45 percent of melanoma patients typically respond to ICB, over 70 percent of the study group had tumors that responded to ICB, an increase in the number of patients with a clinical benefit. Further analysis showed why the treatment worked so well: ICB treats cancer by blocking a surface protein on immune cells called PD-1, preventing its interaction with another protein, PD-L1, on cancer cells. The interaction of PD-1 with PD-L1 turns off the immune cell. This is prevented with these anti-PD-1 antibodies. By blockading PD-1 and preventing its binding to PD-L1, ICB was able to greatly improve the clinical outlook in patients with DM. In fact, it was among the highest rate of responses to any PD-1 blockade therapy in any type of cancer, according to the study. Further investigation into the relationship between a cancer’s ability to fool the body’s immune system and the success of ICB may improve personalized cancer care, according to Sosman. This study was funded in part by the Grimaldi Family Fund, the Parker Institute for Cancer Immunotherapy, National Institutes of Health (NIH) grants R35 CA197633 and P01 CA168585, the Ressler Family Fund, the Samuels Family Fund and the Garcia-Corsini Family Fund. Patients or physicians interested in the desmoplastic melanoma trial can contact cancertrials@northwestern.edu or call 312-695-1102, or view a list of active clinical trials at the Lurie Cancer Center.